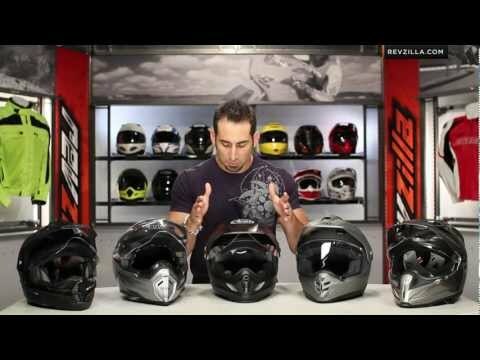 The MX-9 ADV helmet can also transform into a more streetable helmet by removing the peak visor. 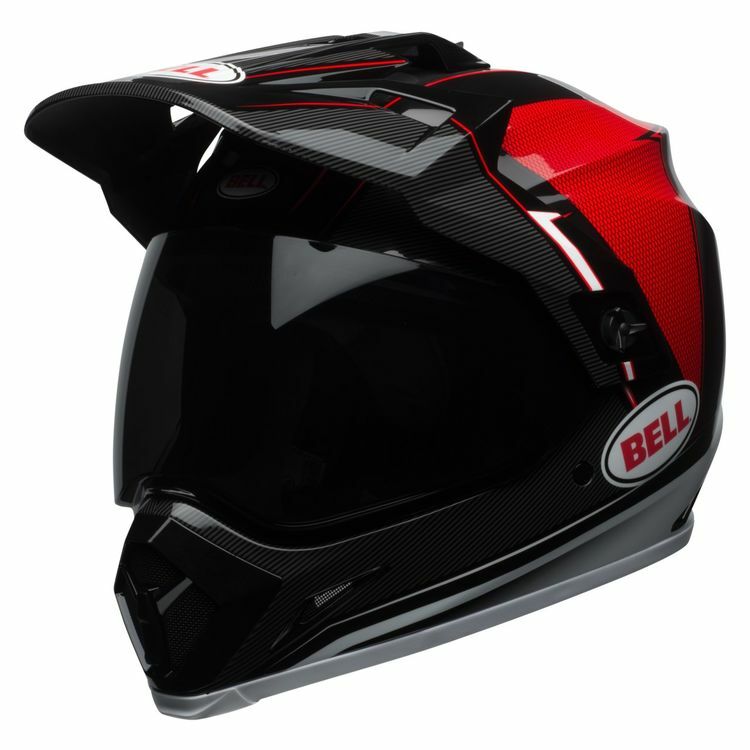 Included side pods replace the visor where it mounts to the helmet, giving you sleek top-gun styling. When you hit the dirt and need the added protection of a pair of goggles, simply flip up the shield and throw 'em on. The MX-9 is designed to work with any dirt goggle out there. 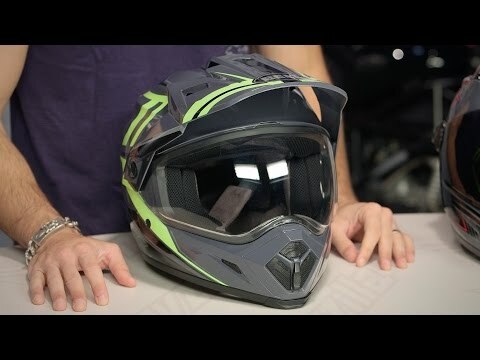 Truly a go-anywhere, do-anything helmet, the Bell MX-9 Adventure helmet fills a much needed gap in the market and is perfect for pros and beginners alike. Note: Helmet ships with clear face shield. Totally happy about this Bell Helmet. Price was fantastic for the quality, style and comfort. Wanted to try out this helmet since I've been riding my (new to me) Honda NC. Compared to a standard full face (in my case an HJC CL-17), the view is WIDE, you barely see the chin piece, and only the tip of the visor if it's installed. Speaking of that, the visor is good for keeping sun off, but as you might expect, pulls a lot of wind above 60 mph. It is quickly removed, turning it into a nice light street helmet. The vents (except for the mouth vent) are always open but work well and should keep me nice and cool once it gets hot this summer. Due to all the vents it's a bit noisy though. All and all it's a neat helmet, stylish, and being able to convert the setup is a great feature. So I had this helmet for a record one (1) day before I crashed, in this case a low side slide right onto the pavement. I kind of fell backwards off the bike, and while I closed my eyes, I certainly remember the loud bang when the back right of my head hit the pavement haha. While I did end up with a mild concussion, this helmet and other gear let me really get away with it; I was able to stand right up, pick up the bike, and roll it off the road. All in all I was very happy with this inexpensive helmet and ordered a another copy to replace my junked one. Awesome ADV helmet for the money. This helmet is light, sturdy, ECE & DOT, extremely comfortable, flows a TON of air, its fairly quite considering how much air it flows, looks awesome, has ability to get a transition shield (sold separately which I purchased and is amazing). I own an HJC RPHA 11 pro, HJC RPHA 70st, and Icon AirFlite, and I keep coming back to using this helmet, its that good, and was also the lowest cost helmet I own. Great value! Love this helmet. Helmet came extremely quick. Great helmet. Amazing field of vision. Very good looking with great protection. It also has little pockets on thr inside for your speakers.